Many of you are aware that I have a LOVE affair with BIO X ISOLATE PROTEIN! I AM IN LOVE! I have been in the industry for YEARS- and have tried hundreds. The flavor profile, processing, manufacturing, quality and purity of the BioX isolates is unparalleled! The texture- CREAMY with water. They are alkaline in the body due to being derived from Sweet Whey and have all 4 and 6 micro/macro fractions intact! They also have Aminogen- which is a patented digestive enzyme to help breakdown and absorb the protein. The Strawberry Banana is the only one I have had that doesn't taste artificial! It tastes creamy with water and I make a killer 'philly cream cheese' dip or cottage cheese/yogurt dip or bars with this. Cookies and Cream is TO DIE FOR! smooth, sweet and mellow. Chocolate- honestly- best chocolate ever. Creamy. Peanut Butter Chocolate- made with read defatted peanut flour- not artificial flavor! Killer! It's like a melted Reese's bar (less salty). Decadent and amazing. I used to LOVE Allmax Isoflex Peanut Butter Chocolate (and still like it but it's an artificial thinner texture) until this came out! I DIED. Strive has a thinner protein with this flavor as well. I am not associated/paid/ endorsed nor have incentive to advertise this. I deal with protein/sports nutrition companies/sell DAILY and this brand is my love. It's a running joke by people that know me. I LOVE IT. I will do an Ultimate Nutrition and Allmax Isoflex review later. They also have some of the best NATURAL WHEY ISOLATE PROTEINS (STEVIA) to date. This is from their site and explains why I love it (besides the taste). They also have a Fusion Matrix and an incredible Whey Protein Complex! Their Protein 32 bars are AMAZING as are most of their other products! The Protein 32 Bars have 32g of Protein, 8-10g OF FIBER! and no sugar!! Check out their PERFORMANCE PROTEINS and CATALOGUE. Whey protein (Power Whey) is the cornerstone of our various protein supplements. Whey is a by-product of cheese manufacturing. In its native state, it is approximately 11% protein, 87% carbohydrates (lactose) and 2% fat. It takes nearly 100 lbs of whey to produce 8 lbs of Power Whey. Power Whey is isolated using a very gentle cross flow microfiltration, ultrafiltration and diafiltration process to remove the unwanted components of whey (fat and lactose) and retain the vital components (the protein, including all of its whey fractions). Power Whey contains a generous amount of all the essential amino acids. It is especially high in the branched chain amino acids and the conditionally essential amino acid L-glutamine. There is over 17 grams of glutamine per 100 grams of protein in the Power Whey Isolate. Next to water, protein is the most predominant substance in the human body. Protein is required in the growth, maintenance and development of all body tissues including muscles, blood, skin, hair, nails, and internal organs (the heart and brain). In short, protein (whey) is essential for life. What is Xtreme Power Whey? Xtreme Power Whey is a whey protein that is isolated using a very gentle microfiltration, ultrafiltration, and diafiltration process to remove the unwanted components of whey (fat and lactose) and retain the vital components (the protein including all of its whey fractions). Xtreme Power Whey contains a generous amount of all the essential amino acids. It is especially high in branched chain amino acids and the conditionally essential amino acid L-glutamine. How is Xtreme Power Whey Different From Other Proteins? Xtreme Power Whey is derived from a sweet dairy whey (many whey proteins are derived from acid whey). This means that Xtreme Power Whey is a non-denatured and complete whey protein supplement. Xtreme Power Whey's special isolation process yields a complete whey fraction profile including: beta-lactoglobulin, alpha-lactalbumin, glycomacropeptides, immunoglobulins, lactoferrin, bovine serum albumin. Does Xtreme Power Whey include Glutamine? Xtreme Power Whey has a very impressive amino acid profile. As far as glutamine content, Power Whey contains a remarkable level of naturally occurring glutamine. There is over 17 grams of glutamine per 100 grams of protein in the isolate. Does Xtreme Power Whey include Glutamine Peptides? Don't be fooled! "Glutamine Peptides" is not glutamine. It is hydrolyzed wheat protein. What's the difference? Well for starters, hydrolyzed wheat protein only contains 30% glutamine as part of its amino acid profile. Some companies add a small amount of hydrolyzed wheat protein and combine it with naturally occurring glutamine in the whey protein in an attempt to mislead you into believing that their product contains a significant amount of added glutamine. For example, in a 50 gram serving of whey protein there is about 8 grams of naturally occurring glutamine. The company will then add 2 grams of hydrolyzed wheat protein and make an implied claim that there is 10 grams of added glutamine in their product! If a product you are currently using is marketed in this manner be skeptical. What else is this company misleading you about? We avoid using hydrolyzed wheat protein (glutamine peptides) in our products as it is a common allergen and a cheaper and inferior source of protein and glutamine. Expectant mothers protein requirements are increased by as much as 30% so whey protein is an ideal source to obtain the extra protein required. Whey protein enhances the body's immune system by raising Gluathione levels. In Short, Whey Protein Is For Eveyone! Does Xtreme Power Whey Contain Lactose? Lactose is a milk sugar that causes bloating and stomach discomfort in some individuals. Xtreme Power Whey is exceptionally low in lactose. There is less than 2% lactose in the isolate. To put this in perspective, a single serving of the isolate has less than 0.5 grams of lactose. In comparison a 12oz glass of 2% milk has 21 grams of lactose. How is Xtreme Power Whey Sweetened? Xtreme Power Whey is sweetened with a revolutionary new sweetener that tastes like sugar but has zero calories. We avoided using any controversial sweeteners like aspartame. Although sucralose (used in our product) is over three times as expensive, it was chosen because we wanted the best and safest choice for you! OMG! Thank you sooo much! I look forward to more reviews. Thanks! I look forward to doing more! Is it gluten free, soy free?? 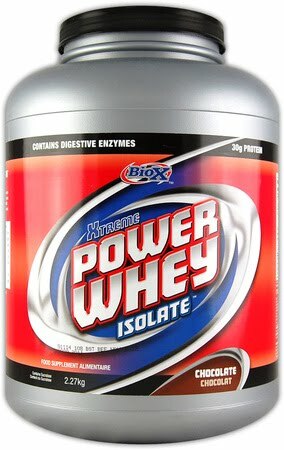 I'm having a devil of a time finding a protein powder that meets my criteria and am hoping Power Whey will work. Thanks. Anonymous- Thanks for the comment! Unfortunately, it contains a little bit of lecithin and is produced in a factory which handles soy! I have many clients with severe allergies (soy, gluten etc) and have them on Genuine Health's Proteins+ and Strive's Pro-ISL. I can send you the link if you leave me your email? Or just check out MY STORE, and I'll add it to PROTEINS/Supplements! is it fast or slow release? It is fast or immediate release because it is an Isolate! Isolates are "pre-digested", sometimes referred to as a "post- workout protein" because the amino acids absorb into your muscles as a faster rate. Isolates are around 90% and up pure protein. Higher bioavailability / Biological value and protein per serving. Thanks for the review! : ) Where did you get this protein from? I can't find the CPB or CnC flavor anywhere! The cookie and cream doesn't really have an Oreo type of flavour, but it for sure has a yummy cookie taste, and it is one of those flavours I won't get sick of. After I tried a sample, I had cravings for it until I went out to buy it. VERY SATISFYING. A bit of a questionable isolate when the ingredients are Power Pro™ (our unique protein blend consisting of: cross flow microfiltered and ultrafiltered whey protein concentrate, cross flow microfiltered, ultrafiltered and diafiltered whey protein isolate, partially enzymatically hydrolyzed whey protein). How can the first ingredient be a concentrate and call the product an isolate. I've seen the power whey lab test results and it claims much higher protein levels on the label than actually exist in the product.